Nathaniel Hendren addresses the 12th Annual Coalition of Schools Educating Boys of Color Gathering of Leaders. 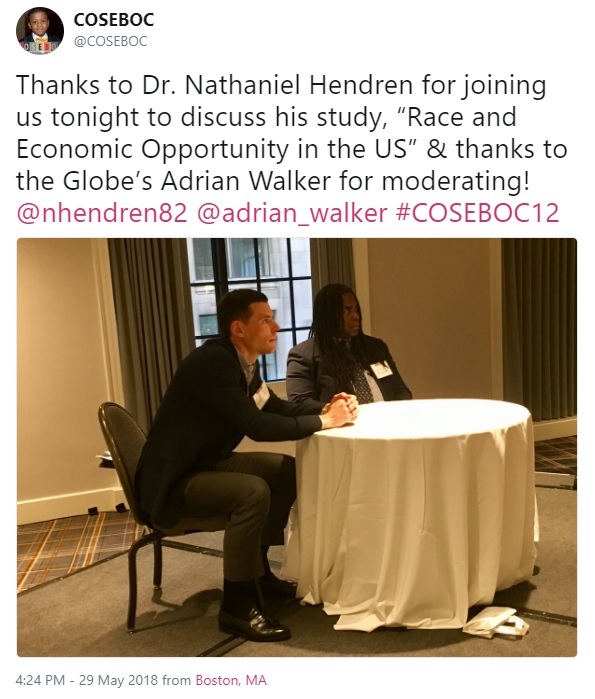 On May 29th, Dr. Nathaniel Hendren addressed the Coalition of Schools Educating Boys of Color (COSEBOC) at the 12th Annual Gathering of Leaders. Nearly 1,000 community leaders, non-profits representatives, educators, and policymakers from across the country attended the three-day event focused on “Boys and Young Men of Color: Liberated, Empowered and Educated.” The conference was cohosted by the Boston Public Schools and My Brother’s Keeper. The power of the theme set the tone for a stirring, productive and engaging convening. Dr. Hendren was honored to kick-off the conference on Tuesday evening with a fireside chat with Boston Globe Metro columnist, Adrian Walker. Dr. Hendren discussed with Walker his most recent research release, Race and Economic Opportunity in the United States: An Intergenerational Perspective (co-authored with Raj Chetty, Sonya R. Porter, and Maggie R. Jones). The research used anonymous earnings and demographic data for Americans now in their late 30s and addressed several widely held myths about race and income inequality. Much attention was paid to the study’s most striking finding that the black-white intergenerational gap is more stark for black males than black females. And, income gaps between black and white males persisted even when they grow up in two-parent families with comparable incomes, education, and wealth, live on the same city block and attend the same school. Hendren noted that black-white income gaps are smaller in neighborhoods with a larger fraction of two parent households and in areas with smaller measures of racial bias, providing potential clues into the underlying reasons for these gaps. Dr. Hendren also noted that black-white gap in upward mobility is driven primarily by environmental factors. This implies these gaps can be addressed by policy and effort, and he outlined potentially new directions to consider. But, a key lesson was that policies such as reductions in residential and school segregation are likely insufficient. Approaches need to address racial integration within neighborhoods and schools. Initiatives whose impacts cross neighborhood and class lines and increase upward mobility specifically for black men hold the greatest promise of narrowing the black-white gap. There are many promising examples of such efforts: mentoring programs for black boys, efforts to reduce racial bias among whites, interventions to reduce discrimination in criminal justice, and efforts to facilitate greater interaction across racial groups. The audience at COSEBOC represented many organizations that engage in such productive efforts. Dr. Hendren concluded that the development and evaluation of such efforts may be a valuable path forward to reducing racial gaps in upward mobility across the US. Engaging questions from many audience members contributed to the evening’s overall feeling of learning and positive momentum in service of boys and young men of color.